12:58 PM I ran across a paragraph in a book about Henry county today, that mentioned the father of Elizabeth Berge Sippel. It lists her siblings, Carl, Burghard, Andrew, George Berge. Her father's name was Berghard Berge, born 17 Jul 1831, Landerfeld Germany. Burghard Berge, Fairfield, was born Jul 17, 1831 in Landerfeld, Cur Hessen, Germany. His parents were Paulus and Elizabeth (Herte) Berger. (spelled with an r). 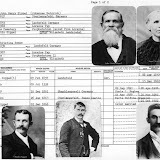 The father died in Germany, but the mother came to America in 1860, and died in Bureau County Il, Mar. 28, 1878. She was the mother of five children: Carl, Burghard, Andrew, George and Mrs. Elizabeth Sippel. Of the above, Burghard Berge came to America in August 1857. He worked three and a half years by the month in Tazewell County Il, and then married and removed to Woodford County, where he farmed three and a half years. He then moved to Henry county, where he farmed another year, after which in March 1866,he came to Bureau County. He bought 80 acres, which he sold, and bought 160 acres in Fairfield township, where he resides. He was married to Hattie E. Parks, who died in Henry County. He married a second time Jan 9, 1866, to Martha E. Miller, born July 5, 1844 in Vockerode, Cur Hessen, Germany, daughter of Johannes and Catharina E. (Grabe) Miller, who died in Germany. Mrs. Berge is the mother of seven children, Mathilda, Johannah, Frederick William, J. Burghard, Carl William, Rosette and Lydia E. Berge. Mr. and Mrs. Berge are members of the German Evangelical Church. Politically, he was a Republican. I was very interested in this, because I was looking for Christina Berge Sippel, but so far have not found a link, but thought this article might be of interest to the relatives of the George from Tampico. 8:50 AM I have since come across the obits and a full set of pictures of the family of Christina Berge and John Henry (Johann Heinrich)Sippel. They were hard to find, since they died in Henry county, Loraine township, but they were moved to the Prophetstown cemetery. Some of these people resided near Tampico, Yorktown, Loraine and Geneseo areas. I would be glad to forward any info or pictures of anyone you are interested in. If you would like to send me the photos, etc. I will be glad to set up a Family Photo Album for the BERGE line. Burghard Berge's bio is also in the Bureau County Bios of 1885 & posted on this site. The BERGE family was represented in our 2007 Yorktown Cemetery Walk by family member Mrs. Terry (Lorraine, nee: Berge) Gaskill (of Tampico). Lorraine has left a copy of the family bios in our Family History Library in the Historical Society. Also, keep in mind that the Tampico Area Historical Society archives all of the Tampico Tornado Newspapers. Many of the obits you seek can be found in these newspapers, especially in the earlier editions. If they were once a member of our area, the obits are often included in the Tornado, even if they died elsewhere. Published from 1876-1966 & special edition in 1981 published by Neil Reagan. You can visit by appt now, or wait until our season opens in April, on Sat/Sun's from 1-4. It is still best to call if you want to do research, since I am the only person that can show your where "stuff" is or turn on the computer! You can also request an obit by contacting me at the tahs@thewisp.net or posting on MESSAGE BOARD. I am am a decendant of Johannes Henry Sippel and Anna Christina Berg ( Christina Berge Sippel). Unfortunately I have less information than you. I would appreciate any information that you can share. 4:16 PM I am looking for any Sippel family information from Bureau county, Geneseo and P-town area that is available. I have emailed Bettei and given her the link to this msg. thread. Let me know if you two connect. Thanks! On 02/11/2008 bettei wrote "I have since come across the obits and a full set of pictures of the family of Christina Berge and John Henry (Johann Heinrich)Sippel. They were hard to find, since they died in Henry county, Loraine township, but they were moved to the Prophetstown cemetery. " Did you receive the photos that are mentioned and if so, are they available. I would like to find some photos of the Johann H Sippel family. 9:37 AM John, I have not heard back from Bettei, have you? I do not recall receiving anything from her - I would have posted it to the site. I will email her again and hopefully we will connect. I'll also check the Historical Society's Family History Library/Research Center and see if they are there. No, I did not hear from Bettei. I wonder if her e-mail is still active. Thank you for your time and work. Her email should be valid - it is a web-based email, so she can use it, regardless of her ISP. (which I'm sure you already know). I emailed her again, double-checking the address. I've asked her to at least acknowledge that I have the correct email address. Will let you know if/when I hear from her. 7:10 AM Sorry to have missed your mail until now. Hotmail is my secondary email I use, and rarely check it. I just now scanned pages of my family scrap book and emailed it to this addy...tampicohistoricalsociety@gmail.com. I hope both the pictures and the text in the obits are clear enough for you all to read. 2:02 PM Thank you, Bette! Click on photo to open album, enlarge and you may also leave comments below photos. 10:58 PM Thanks Denise and Bette! This information was missing from my family album. I am a direct descendant of this Sippel family. I will be sure to pass this on to other family members so they can benefit from this also. 6:39 AM John, how are we related then, if you don't mind me asking? Henry was my paternal great grandfather, his daughter Clara was my grandmother. Sadly she died very young when my father was around 9 years old, so these are the only pictures I have of her. 9:09 PM Bettei - I have sent John your email, in case you want to discuss this privately.